I have said it too many times to recall, but I have long been obsessed with French Pharmacy skincare, and Vichy is one of my favorite brands. They have so many amazing products, and I have two current favorites that I want to share with you. 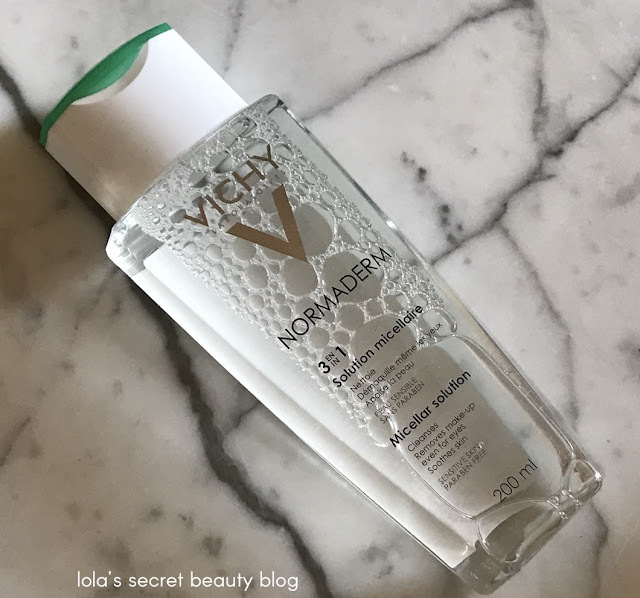 Vichy Normaderm 3-in-1 Micellar Solution is a wonderful micellar water that is specifically formulated for oily skin, and while I have normal/combination skin I have been reaching for this lately because I have been having mild breakouts on my chin. It is very gentle, it doesn't strip the skin, and yet it thoroughly cleanses. It has really helped clear my skin, and while I only use it as a spot treatment– it should prove effective on your entire face if you have oily skin. This Micellar no rinse cleanser is both effective and gentle. It contains Zinc in order to purify oily skin and is suitable for sensitive skin. Normaderm 3 in 1 Micellar Water Cleanser for oily skin. It is a one-step cleanser that purifies skin, removes make up and tones without dryness or irritation. Suitable for sensitive skin and eyes. Directions: Apply micellar water with a cotton pad. Smooth the pad from the center of the face outwards to remove impurities. Pay attention to the eye area: cover eyes with a cotton pad and press lightly to soak skin and lashes. Remove make-up by pressing gently towards the front of your eyelashes. Do not rinse off. Ingredients: Aqua / Water - Hexylene Glycol, Glycerin,Poloxamer 188, Zinc PCA, Sodium Lactate, Sodium Chloride, Disodium Cocoamphodiacetate, Disodium EDTA, Iodopropynyl Butylcarbamate, Citric Acid, Dihydrocholeth-30 and Polyaminopropyl Biguanide. $14.50 for 200 ml. from Vichy USA and Target. Vichy Mineral 89 is described as a "new generation face moisturizer." It features 89% of Vichy's iconic Mineralizing Thermal Water that is further enhanced by Hyaluronic Acid to deeply boost hydration and fortify the skin. The consistency is that of a lightweight gel-like serum that sinks into the skin immediately leaving it hydrated with a luminous, ethereal glow. Dehydrated and dull skin gives way to comfortable, refreshed and moisturized skin without any greasy residue or stickiness. Furthermore, this fragrance-free moisturizer plumps fine lines, nourishes the skin and leaves skin soft, smooth and supple. It offers my normal/combination skin enough moisture and hydration during the summer that I can forgo a regular moisturizer altogether, and it pairs beautifully with my favorite serums and face oils, but during the rest of the year I layer it with richer moisturizers. For the 1st time, a breakthrough moisturizing formula, with 89% Mineralizing Thermal Water to help strengthen the skin’s moisture barrier and make skin more resistant to visible aging caused by environmental factors combined with hyaluronic acid to hydrate and plump skin. Minéral 89 face moisturizer fortifies and makes skin more resistant to visible aging caused by pollution, stress to skin, and fatigue. Its moisturizing formula boosts hydration to replenish the skin's moisture barrier. As a result, skin feels more hydrated, plumped, and toned. Day after day, skin radiates with a healthy glow. Vichy's Suggested Use: Apply morning and evening to cleansed skin by spreading a touch of booster all over the face. Spread with outward movements from the middle of the face, without applying too much pressure. All skin types benefit from Mineral 89. It can be easily included in any beauty regimen after cleansing and before your usual serum and/or moisturizer. Ingredients: Aqua, Phenoxyethanol, Caprylyl Glycol, Glycerin, Butylene Glycol, PEG/PPG/Polybutylene Glycol-8/5/3 Glycerin, Methyl Gluceth-20, Citric Acid, Sodium Hyaluronate, Carbomer, Biosaccharide Gum-1. Formula Properties: Pure and Clean, Oil free, Alcohol free, Fragrance free, Silicone free, Colorant free, Paraben free, 100% transparent formula, Allergy-tested, Tested on sensitive skin and tested under dermatological control for safety. $29.50 for 1.69 oz. from Vichy USA, Ulta, Amazon, Dermstore, Skin Care RX, SkinStore and Walgreens. Overall Assessment: I really love Vichy products, and love discovering more of their offerings. I am already on my second bottle of Vichy Mineral 89, and while I will go through the Vichy Normaderm 3-in-1 Micellar Solution much slower, I will definitely use it whenever I have a breakout. Vichy makes such fantastic products, and these are definitely really good. I completely understand why your mom is a big fan of this brand! 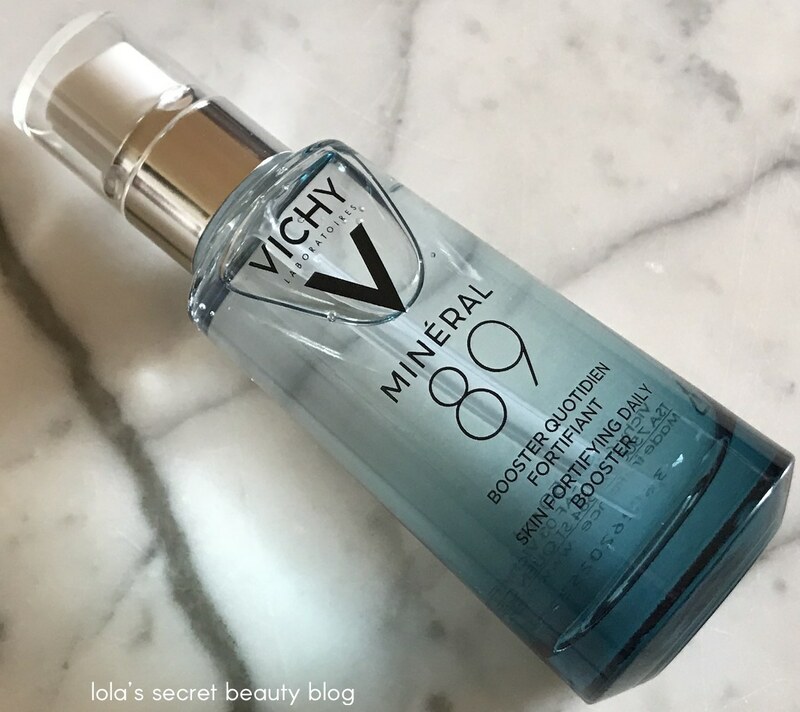 Mineral 89 is one of my absolute favorite Vichy products, and I certainly understand why you enjoy it so much! The packaging is amazing, I agree! It is generally a good thing, but there are definitely times when my skin has a super negative reaction! I can't live without my micellar water! 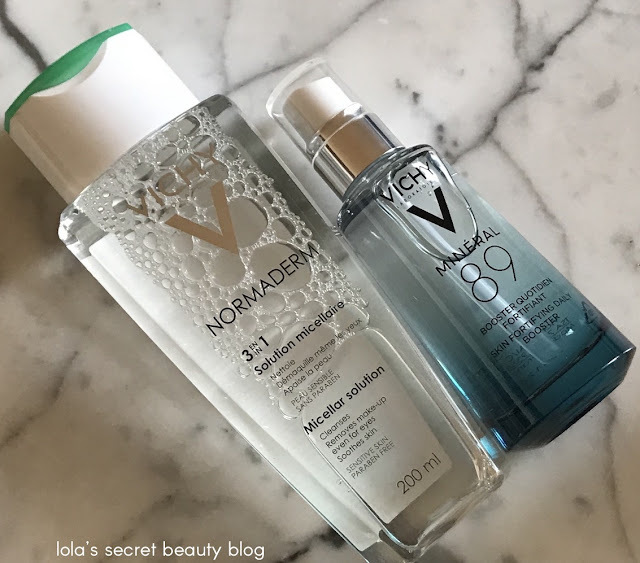 Micellar water is a favorite for me as well! The Mineral 89 sounds absolutely terrific. This is something that would fit well into my routine. It really is, and it is one of my very favorite products from Vichy. I definitely think that you would love this. I've been having breakouts on and around my chin too, what's up? Maybe I should the micellar water and I really want to try that moisturizer! You too???? I think that when I am grading papers and reading that I put my hands on my face when I am thinking– I think that it is an unconscious reflex, and I am pretty sure that is the culprit. This Micellar is really helping clear it. Mineral 89 is something that I REALLY think that you would love! I highly recommend it, Cindy.